Who doesn’t love a great Tiki cocktail while sitting on the beach? Or perhaps you have a favorite Tiki bar. But, now you can make the best Tiki drinks at home and enjoy them in your own backyard this summer! 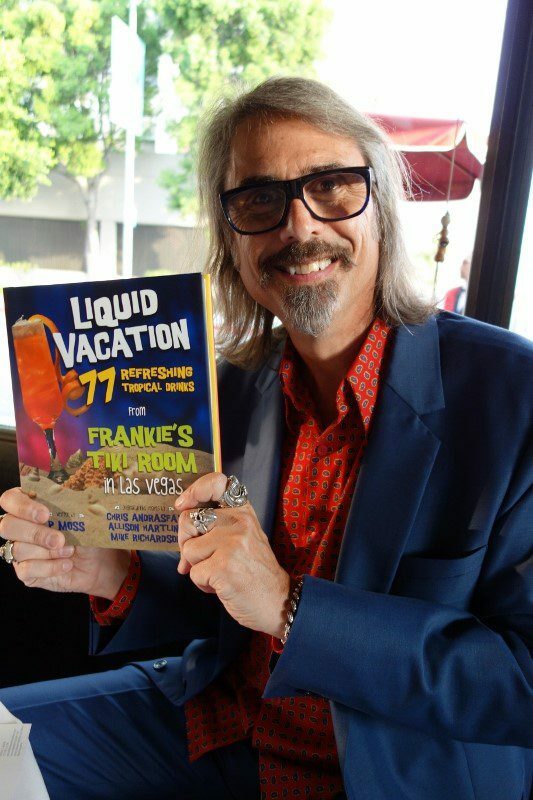 P Moss, a Tiki historian who owns Frankie’s Tiki Room in Las Vegas and the Double Down Saloons in Las Vegas and New York City, recently released his new book LIQUID VACATION: 77 Refreshing Tropical Drinks from Frankie’s Tiki Room in Las Vegas. Located just off the Las Vegas Strip, Frankie’s Tiki Room is the world’s only 24/7 tiki bar, known for its blend of Polynesian tradition with a hint of Las Vegas kitsch. With 150 rums and 24 cocktails on the menu at any time, Frankie’s Tiki Room has created many cocktails that have been a secret…..until now. LIQUID VACATION offers recipes for 60 original Frankie’s tiki cocktails and 17 traditional tiki cocktails. Each recipe has an explanation of its heritage, ingredient list and step-by-step instructions, along with photographs and illustrations. The book also offers suggestions and alternatives for hard-to-find ingredients. In addition, the book provides a history of tiki cocktails, tiki cocktails in Las Vegas, Frankie’s Tiki Room and tiki mugs. We decided to test out a couple of these recipes to see how easy they are to make at home. We selected one of Frankie’s Original Tiki Drinks and one Classic Tiki Drink. 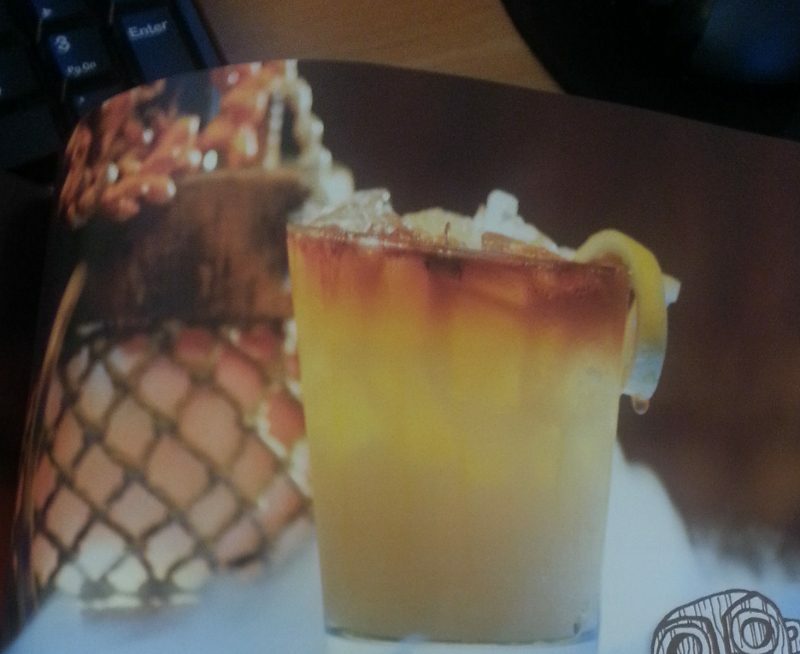 Check out the results of our cocktail next to the book photo. Place all of the ingredients except the pear nectar and rosemary in a mixing glass. Add ice and shake until the raspberries break up. Pour the contents into a 17-ouce snifter, then top with pear nectar. Strip all of the rosemary leaves off the sprig except those on the very end, for an added essence of rosemary when stirring the drink. 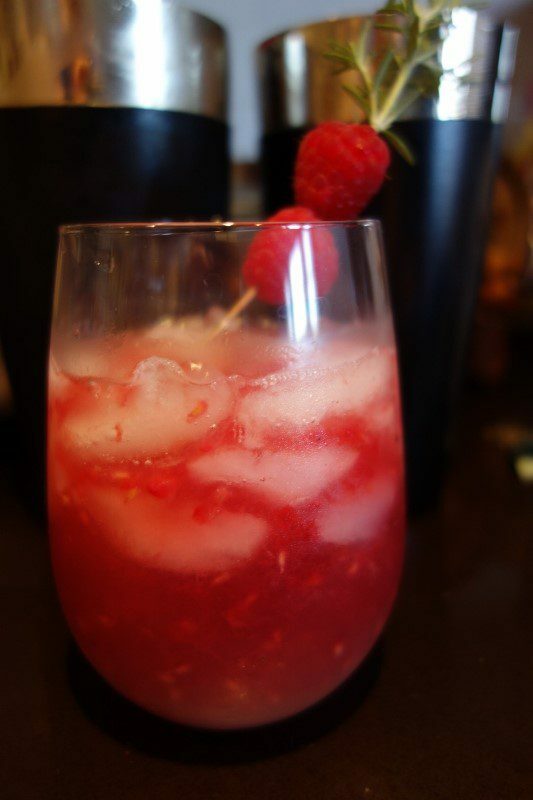 Spear a raspberry with the sprig and garnish the drink. Results: An easy cocktail to make, although finding Pear Nectar was a bit of a challenge. When you raise the glass to your mouth, the rosemary aromas are dominant but the sweetness of the raspberries and the gin come through on the palate in this bright, fruity cocktail. 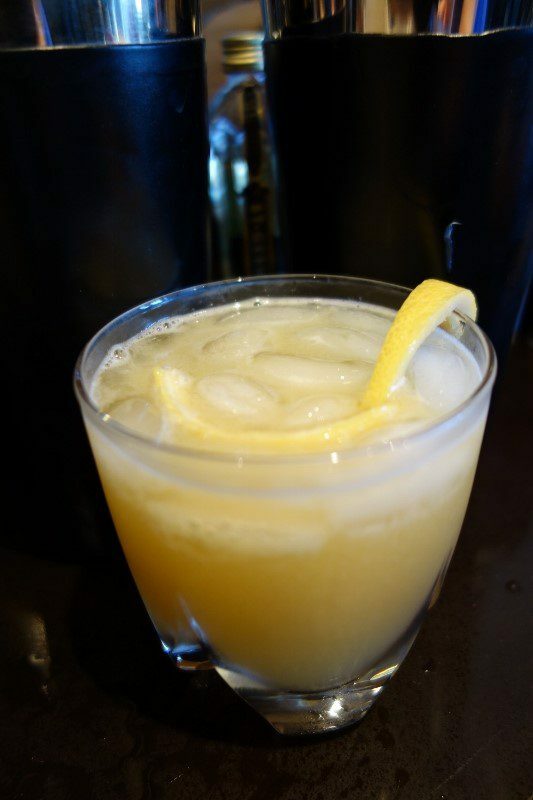 Fill a 14-ounce double-old-fashioned glass with ice, then add rum, brandy, gin, syrup and juices. Pour contents into a cocktail shaker. Shake well, then re-pour into the glass. Float the sherry on top. Serve garnished with a lemon twist. Results: Sadly the cream sherry didn’t sit at the top and slowly float down the drink, but otherwise, another very simple cocktail to make. The tart lemon really stands out in the bright, crisp Fog Cutter. So, in the end, the recipes were easy to follow and our results seemed to match the book’s pictures…..plus the drinks were tasty. We are looking forward to trying more recipes in P Moss’ Liquid Vacation. 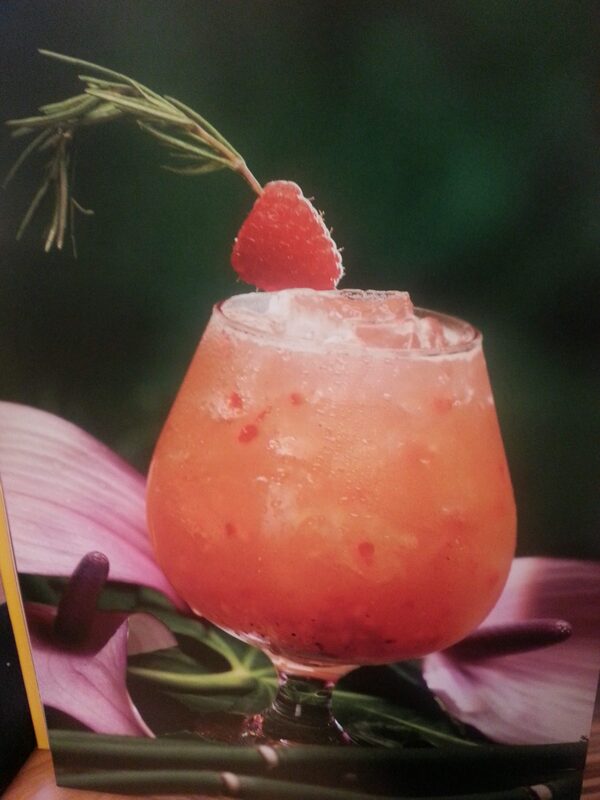 This entry was posted in Cocktails, Lifestyle and tagged Double Down Saloon, DrinkWire, Fog Cutter, Frankie’s Tiki Room, Las Vegas, Liquid Vacation, Liquor.com, P Moss, R&R, Tiki, Tiki cocktails, tiki drinks, tiki2013 by Allison Levine.